Hand appliqued, these 3-piece 100Percent cotton crazy ruffled quilt sets are pre-washed for softness. Diagonal frills create a fun pattern and are a great addition to any bedroom. Disarranged ruffles create a unique style that adds dimension to any bedding set. You will love that they are machine washable for easy care! discover crisp, classic bedding in an array of solid colors with cottage-inspired design touches. Patterned stitching, ruffles, and other design details add a little flair to standard solid sets. 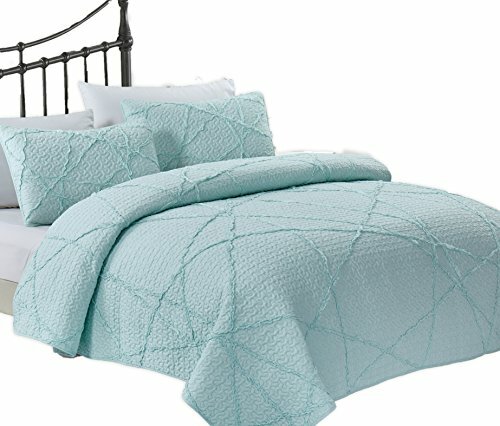 This soft, beautiful quilt set is a functional and decorative way to upgrade any living space, from an off-the-grid cabin to a shabby inspired guestroom. With a lightweight feel, they're perfect for a new home or existing space. They feature a soft, cozy texture that's warm and lightweight, and they work beautifully on their own or make a perfect layering piece. Every set is colored using top-quality dyes to ensure they retain their vibrancy over time. Care is as easy as slipping them into your washing machine. If you have any questions about this product by California Design Den, contact us by completing and submitting the form below. If you are looking for a specif part number, please include it with your message.